A subtle shifting of the high pressure centre towards the southwest will start to swing the wind to more of a northerly or northwesterly, bringing slightly cooler conditions across the UK. There should, however still be plenty of warm sunshine so, in general, temperatures remaining above average for the time of year. The northerly wind may well drag in a few showers over western and northern Scotland but most areas should be predominantly dry. Signals look good for a continued spell of settled weather into October as high pressure looks set to remain largely in force. It is unlikely to be totally dry through this period - it is October, after all - the most likely place for any wet weather being the north. As we head through October the nights will get longer; consequently we'll see both lower daytime maxima and lower night time minima. Early signs are though that there should still be plenty of sunny and warm days yet to come. The weather is of particular interest because I’m going walkabout next week for a week. 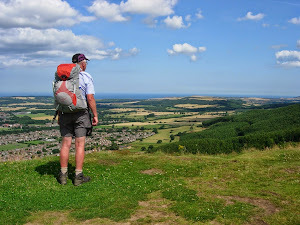 I have two routes in mind – one an easy walk (a few hills and some camping), the other easier (no hills, no camping), both in the north of England. I’ll decide which route on Monday and head north on Tuesday which will leave me seven days for walking. It’s blogged and logged BBC Weatherman! You’ve got yourself fairly well covered but you are still optimistic about decent weather. Here’s hoping. Have a good walk, Brian. Nice to have you back posting again. Thought about a competition with prize for blogger with correct/nearest answer but, inspired by your pre-Jersey blog of 22 Aug, I opted for a tease instead. Pretty sure I'll go for the easiest walk but will let the dice decide. If I don't get what I prefer first throw then I'll make it "best of three". I like to read this kind of thing as I have a trip planned for mid October. Looking forward to reading about your trip up here in the north of England. Most likely be Tuesday when I start wittering.